This blog, in two separate entries, has already featured two musical groups — Black Oak Arkansas and the Dan Blocker Singers — that relocated to the Ozarks to start their own community, whether it be called a “commune” or something else. Another act worth mentioning is John Michael Talbot, who, along with his brother Terry, was in the late 1960s country rock band, Mason Proffit. The band, which sang socially conscious lyrics (such as the one above), has been hailed by music critics as one of the best country rock bands to never hit it big. Talbot’s biography is that of many musicians from his era. After a while in the music business, he became disillusioned with the rock ‘n’ roll lifestyle and in search of something more meaningful. His spiritual journey led him to Catholicism and monasticism. While in Mason Proffit, Talbot, who was born in Oklahoma City, Oklahoma, bought land near Eureka Springs where, several years later, he founded a monastic community named The Brothers and Sisters of Charity at Little Portion Hermitage/Monastery, listed on his website as “an ‘integrated monastic community’ with celibate brothers and sisters, singles, and families.” The community is still going strong today and offers retreats for those wishing to explore monasticism. He continues to sing and perform, this time Christian music — and successfully, as well. Several of his albums have made the Billboard’s Top Contemporary Christian album charts and won awards. You can’t dispute the force that was behind Hardy, Arkansas’ Teddy and Doyle Wilburn, the duo who made up the Wilburn Brothers. Talented musicians in their own right from the Ozark foothills town, these stars of the Grand Ole Opry were also responsible for launching many careers, including that of Loretta Lynn’s. They also had a syndicated television show from 1963 to 1974, which is currently being broadcast on the RFD-TV network. Above, they sing homage to locales in northeast Arkansas, such as Crowley’s Ridge and cotton fields. And, below, on a different Wilburn Brothers Show, here’s a performance by Benton County native Vernon Oxford, apparently wearing a suit by Nudie’s Rodeo Tailors — the same company that made the glittery suits of Porter Wagoner. Honky-tonk at its finest. In 1954, the CBS news magazine show, “The Search,” came to the University of Arkansas to meet with English professor and musicologist, Mary Celestia Parler. She was the Ozarks’ own Alan Lomax, wandering around in the backwoods and barbershops with a tape recorder, collecting long lost folk songs, much like her contemporary, Batesville native John Quincy Wolf. Narrator Charles Romine gives it a bit of a “Twilight Zone” vibe and, really, it was a twilight zone — a place where centuries’ old songs were kept alive by the aging rural Ozark folks of Arkansas. Shown singing here is Mary Brisco of Berryville. The introduction in this short video, sadly, doesn’t take us far into the journey. Consisting of Los Angeles band groupies, the GTO’s were one of many experimental music projects undertaken by rock legend Frank Zappa in the late 1960s. Girls Together Outrageously’s most famous member was best-selling author Pamela Des Barres, who wrote tell-all books about her exploits with the many musicians she slept with. A condensed history of the group can be found here. Yet, it was a song credited to GTO’s member “Miss Cynderella” that would perk up the ears of any Arkansan, “The Eureka Springs Garbage Lady.” It appeared as the opening track on their album, “Permanent Damage,” with the line, “She creeps down the lane as sane as you make her … ” with following lyrics that are, at times, indec ipherable. Now more than 40 years later, “Permanent Damage” is more of a sociological time piece with a “who’s who” of rock and pop music that included contributions from Davy Jones of The Monkees, Jeff Beck and Rod Stewart. Yet, Eureka Springs, in the late 1960s, was on the verge of coming into its own counter-culturally. The town with steep, curvy streets lined with Victorian-era buildings made an attractive location for artists and hippies that, today, has led to a city government accepting of alternate lifestyles and marijuana usage. (Roger McGuinn of The Byrds used to spend summer vacations in Eureka Springs as a child.) 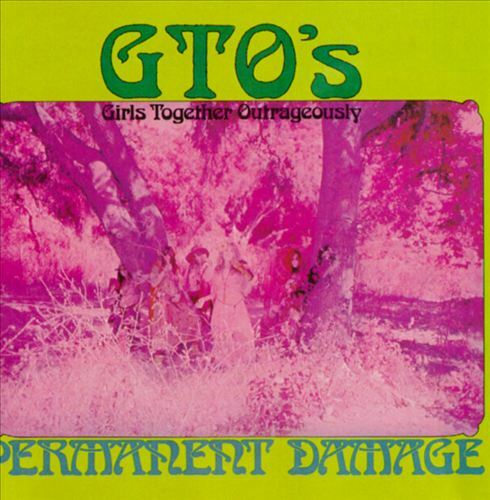 It was a perfect local for a GTO’s song, whether the group members were aware of it or not. Though wasn’t called rock ‘n’ roll then, the Ozarks heard plenty of it in the late 1940s and early 1950s, especially when Johnnie Lee Wills came to town. The musician, brother of Bob Wills of Texas Playboys fame, routinely left his home base of Tulsa, Oklahoma, to play throughout Northwest Arkansas at VFW and Legion halls — Lincoln and Huntsville were among the towns — not to mention the occasional fraternity dance at the University of Arkansas in Fayetteville. 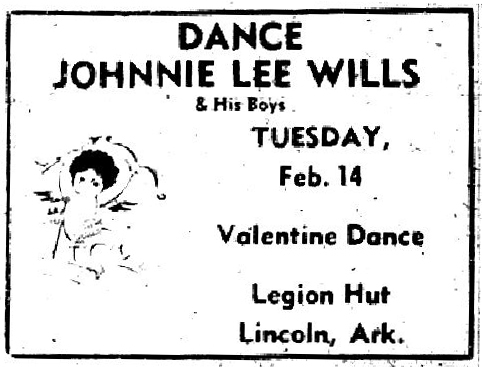 1956 ad for Johnnie Lee Wills, who performed in the Arkansas Ozarks on a regular basis. Johnnie Lee performed in his brother’s band before they parted ways in the 1940s. Remaining band members joined Johnnie Lee to form Johnnie Lee Wills and His Boys, a regular fixture on Tulsa AM radio station KVOO, which undoubtedly could be heard in the Arkansas Ozarks. Western swing, the style of music performed by both Bob and Johnnie Lee Wills, morphed into rockabilly, which Johnnie Lee performed before it was called such. (Bill Haley, a more prominently known early rock ‘n’ roller, also began his career by performing Western swing.) In the 1940s, Johnnie Lee was one of the first to record a song attributed to one of the founding cores of rock ‘n’ roll, “Milkcow Blues,” credited to Kokomo Arnold, who recorded it for the Decca record label in 1934. Johnnie Lee always contended he recorded his own version of the song unaware of Arnold’s version. The song later became a rock ‘n’ roll standard through a rendition by a young Elvis Presley retitled “Milk Cow Blues Boogie,” which sounded much more like Johnnie Lee’s version than Kokomo Arnold’s. Johnnie Lee scored big with his sound in 1950 with his hit song “Rag Mop,” which climbed to No. 2 on the Billboard magazine country chart. A few years later, rock ‘n’ roll would truly come to the area, most notably at the University of Arkansas and its nearby nightclubs. But whether or not people knew it then, Johnnie Lee Wills had already planted the roots of rock ‘n’ roll. 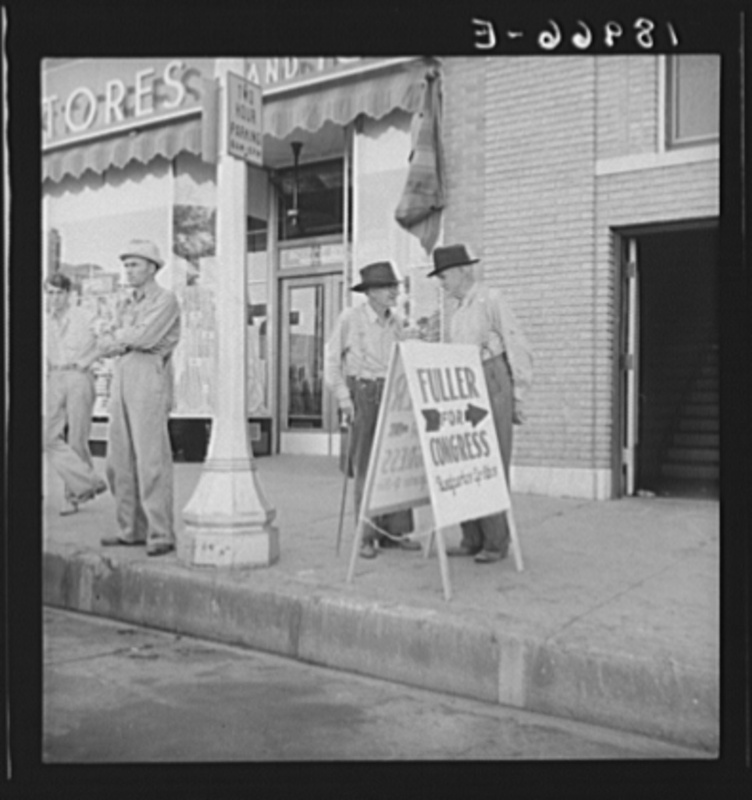 Two men stand by a sign asking voters to re-elect Claude Fuller to U.S. Congress in this photo taken on the Fayetteville square in the late 1930s by photographer Dorothea Lange. The Works Progress Administration during President Franklin D. Roosevelt’s administration hired many unemployed men and women to carry out various jobs for the government. The WPA programs included the Farm Security Division, where photographer Dorothea Lange traveled to rural America to collect Depression-era images. She is probably best known for her photos Migrant Mother photo, taken in 1936 in Nipomo, California. Not as well known are her photos she took in Arkansas in 1938 and 1939. Thanks to the Library of Congress, however, they’re available in a searchable database. Her series of photographs of the Ozarks include two elderly men standing on the Fayetteville square next to a Fuller for Congress sign and what appears to be two farmers standing next to what could be a Ford Model A in downtown Rogers. She also shot a scenic photograph of the Ozarks featured at the top of the page as the banner for the Echoes of the Ozarks website. 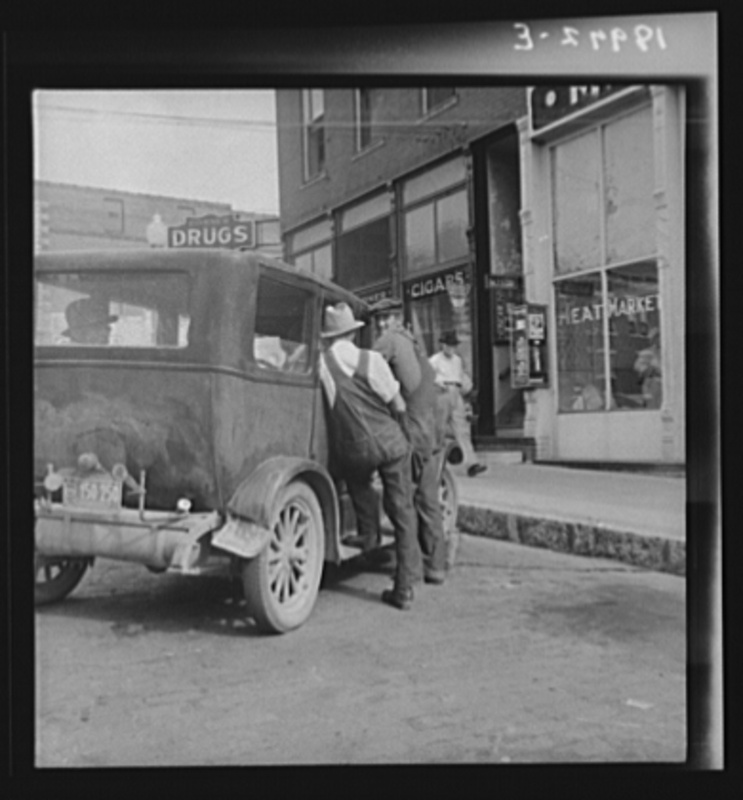 Photographer Dorothea Lange captured these men visiting in downtown Rogers. But here’s why the Library of Congress’ database is great: There are so many images of the Arkansas Ozarks besides Lange’s, such those by those of Arthur Rothstein, best known for his documentation of the Dust Bowl during the 1930s. Of course, one could get lost just surfing the database for images of other states, places and events in history from bygone eras.